If somebody had to say that the movie helped him understand the plot better, it would not be a surprise. It is now tested and accepted that the visual has the capacity to make a larger and deeper impact on the human brain. The marketers have been using this formula for quite some time and now the trends are moving faster. The picture says it all: For a lot of brands, the visual branding has worked wonders. Be it soft drink giant Coke or automobile biggie Volkswagen. Their advertising campaigns over the ages have seen multi dimensional shift, but in all times they have kept the consumer talking about it. Go the classy way: The feel of a bygone era is eternal. That is one reason why the fashion keeps bouncing back. The same goes with the visual. A lot of companies have utilized this trend by turning their ad campaigns into a black and white feel. Take the most searched subject: For a business that needs to keep the consumer engaged. It is important to research on a subject which is live and trending. Participating in the most happening issue around and depicting it through the brand can grab the consumer’s interest. Innovate and exercise: Exploring new options of visual marketing should be a welcome sign. Design arts have transformed the way the brands represented themselves. So, it is advised to join the bandwagon and practice something new. Share a lot: Once the brand has the visual impact in its hand, it is time to move out and share. The brands online make it part of its campaigns, ads, banners, profiles to help attract traffic. The fans like to talk about it and share the idea further. This keeps the ball rolling. I still am in the process of figuring out what is it exactly known by? I think the marketers too are discussing a jargon for it or better yet a lingo to go by. But I guess the term more popular is minimalist advertising. And which one of the brands wins the race? Quite a few of them are the contenders here. I will give it to Volkswagen. They sure have come a long way from their ‘Lemon’ days. Remember a small black car and an elaborate ad copy talking how Volkswagen takes care of delivering only the best product to their customers. The one which is not worth never makes it to the world outside. Superb idea. What could hold a consumer’s attention and empathy, more than assuring them of how they are being thought of and taken care of. So, here was Volkswagen talking at length about their brand and its quality standards to keep that consumer under its arms. That was then. Now, things have changed. It’s more than change, it is revolution. They don’t talk much now. What is characteristic of a Volkswagen advertisement is that they take the crux out of the machine, as in the idea on which they would like to market the car a.k.a USP of the product and build an advertisement around it. With every new machine, they break the mould (the one surprisingly made by themselves). It’s like breaking one’s own record. Well, they do match their promise of the product in real. No kidding that. But beating other automobile brands in terms of advertising is just another feather in the cap. 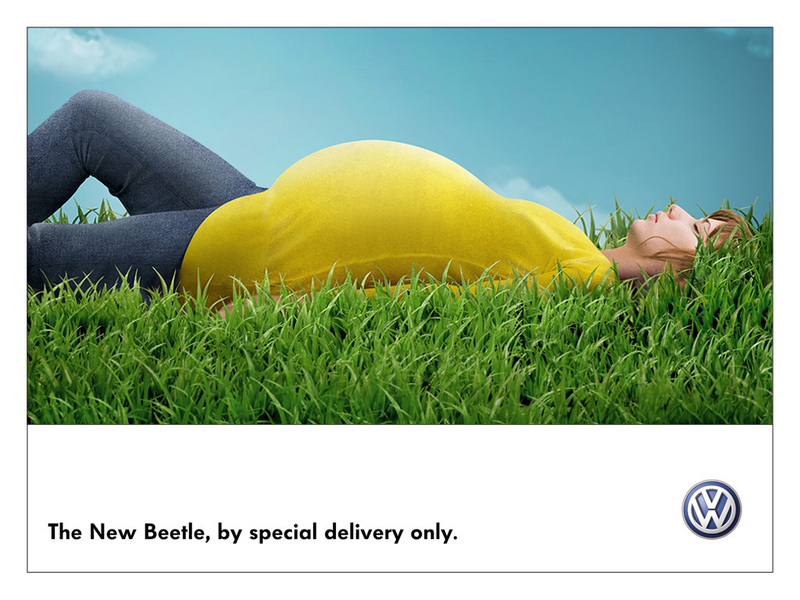 What’s striking about a Volkswagen ad is the large section of the visual that captures the eyeballs. More often than not, it says more than what meets the eye. Yes, the remainder of the missing information is beautifully woven into a single sentence of the ad copy. The words are carefully chosen to express the most of information about the machine in the best and least of vocabulary available. It’s a success, all of the time. Only a crystal clear brand strategy can bring about a consistent brand message that flows through each of the variety offered under the name of Volkswagen. The effect remains the same because the message is always powerful just like the product. So, with Volkswagen there’s no pomp and show, only the real deal. The message can be layered with a metaphor or a simile but it still talks of the ground reality, the fact what is going to be presented in the form of the product. Thus, the minimalist advertising strategy wins by giving the sense of more though saying less. Blame it on Unilever (then Hindustan Lever) to bring about Lalita ji, to a very naïve and non-experimenting Indian consumer circle. The brand (read Surf) was smart to connect the idea of a good product with the buyer’s intelligence. And so the revolution began. The consumer understood the fact that with liberalization, the market would offer choices and that would make the former more stronger, which in turn would allow him to have the last say in where the money goes. (Trust me, that’s all we think). That was the beginning of problems for brands and their marketers. Now, it was no more the fight of getting a chunk of that cake (read market/economy/capital) but also how long the cake lasts. The longer it is there, the sweeter it is. So, the idea was not just sales, but, sales based on long term relationship with the consumer. The consumer on the other hand was having the best of times and they still do. Before anybody could realize or let alone picture the future, the market was flooded with brands in just about all categories (and it’s growing exponentially with the retail arena). Hence, the inevitable competition. Thankfully, for a market like India, a marketer could pick and choose a category (based on socio-economic/income group distribution). Here, lay the catch. A well-read consumer (or forget that, just think of someone who is biased with feedbacks from others) would turn out to be a very tricky customer and in Indian scenario they play(ed) a dramatic role. So, with total pun intended, this ‘smart’ consumer knew his way out and he wanted everything; economy, luxury, value and style too. Thus, the brands just had to play their cards right. Say for example some brands relied on innovation (and it’s not always about the technical ones) and have come to be known for that e.g. Pepsi, some played with the sentiment e.g. Titan, Asian Paints, some relied on offering quality e.g. Amul, Colgate. These were just a few but miraculously the ones those survived the market wars and emerged triumphant. The ones who could not, just took a bit too long realizing what the consumer wants? Well, if nothing else, the current players take a lot of interest in consumer understanding based on extensive research tools and pay heed to what is being asked out of them, which eventually shows in frequent upgradation of product quality and variety. And the consumer seems to be having the biggest grin of the century. So much for Lalita ji, I say.